One reason conflict can undermine self-control is that stress compromises our brains’ emotion-regulation circuitry. But all is not lost when we’ve been emotionally hijacked. Recent research offers a new tool for regaining self-control soon after the stress of an argument: Briefly reminiscing about a happy memory. You’ve just had a tense exchange with a colleague when your assistant reminds you of the important committee meeting starting in a few minutes. You’re in the middle of an argument with your spouse when your dinner guests pull in the driveway. You’ve excused yourself briefly from a tense negotiation and have to go back into the room soon. What do these all have in common? You need to get your balance back and you need to do it fast. Thank goodness relief may be only a trip down memory lane away. Acute stress elicits negative emotion, lessens our ability to use cognitive emotion regulation, diminishes responsiveness to rewards, and is often a precursor to anxiety and depressive episodes, making it imperative to identify effective strategies for reducing stress. The challenge, of course, is that it’s daunting, sometimes even impossible, to will ourselves back into a positive emotional state when we’ve just had a bad experience. Acute stress releases what the researchers suitably term “a cascade of hormones,” including cortisol, which have undesirable effects on working memory and decision-making, among other things. So we need a mental trick of sorts to help us out in those moments where willpower alone isn’t enough to induce a positive mental state. Cue the pleasant autobiographical memories. It’s long been known that autobiographical memories can evoke the emotions of the original experience. So is it possible to evoke positive emotions, even in the face of acute stress, to “trick” ourselves back into an emotional state that will serve us better? Researchers Megan Speer and Mauricio Delgado conducted two experiments. In the first, participants immersed their hand in ice water (a classic stress-inducing experience in psychological research) while reminiscing about a chosen experience. Some were asked to recall a happy memory, such as an old family trip to Disneyland, while the rest were asked to recall a neutral memory, such as packing for a trip. The participants who’d reminisced about a happy experience showed much lower cortisol levels and reported improved mood as compared to those who’d recalled the neutral experience. Next, Speer and Delgado recruited a new group of volunteers to repeat the ice water experiment while undergoing brain scans with fMRI. The participants who’d reminisced about happy experiences showed increased activity in the brain regions associated with cognitive control and emotion regulation. 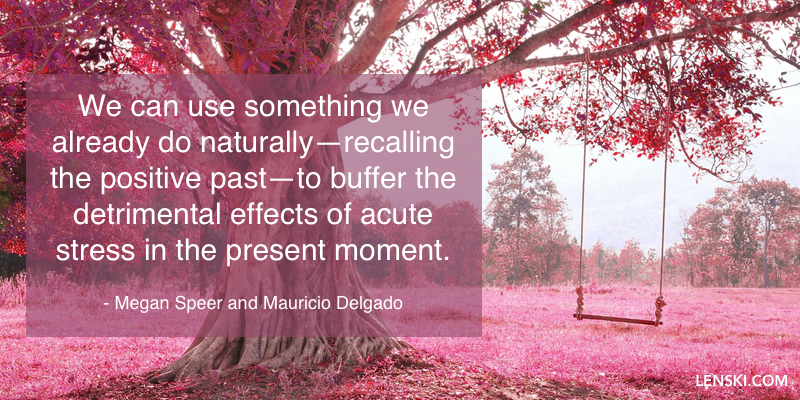 When uncontrolled psychological stress can drive us far from a desirable state, enhancing positive feelings by reminiscing about the past may be one way to bring us back. In the studies, the memory was chosen before the stress event. Rather than trying to conjure a happy memory when you’re most in need of it, the study suggests you should “pre-identify” a happy memory you’ll rely on for regaining self-control. That said, the happy memory should be unrelated to the stressor. So you might want to have a few happy memories tucked away for use. Positive memory retrieval may not be effective for everyone. For instance, people with depression tend to have fewer, less detailed, or less vivid positive memories, or may have general difficulty recalling the past. The study examined acute stress (the kind that gets your heart pumping, your hands shaking, etc. ), not chronic stress (think “seriously unhappy marriage” or conflict that’s been highly unpleasant for years), so it’s still unknown if the effect will work in chronic stress situations.